Everyone loves a good mystery. Mysteries make you think, consider, discover, use deductive reasoning and critical thought. 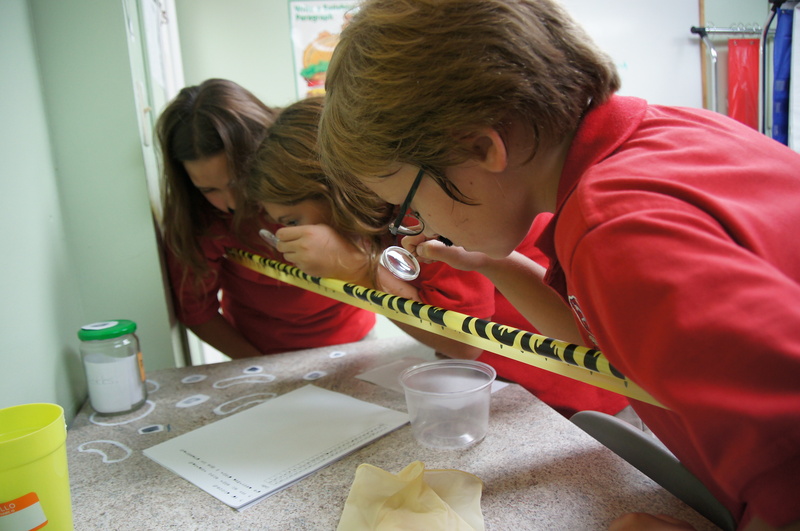 The Lower School Talent Pool students are using all these skills as they solve a mystery, The Case of the Missing Pickles. Students scour the crime scene for clues. This all started about a week ago when Mrs. Kubach noticed that her pickle erasers had gone missing from the eraser jar. A crime scene was set and one of the Boca Raton police department officers came to visit the classroom for an inspection of the area. 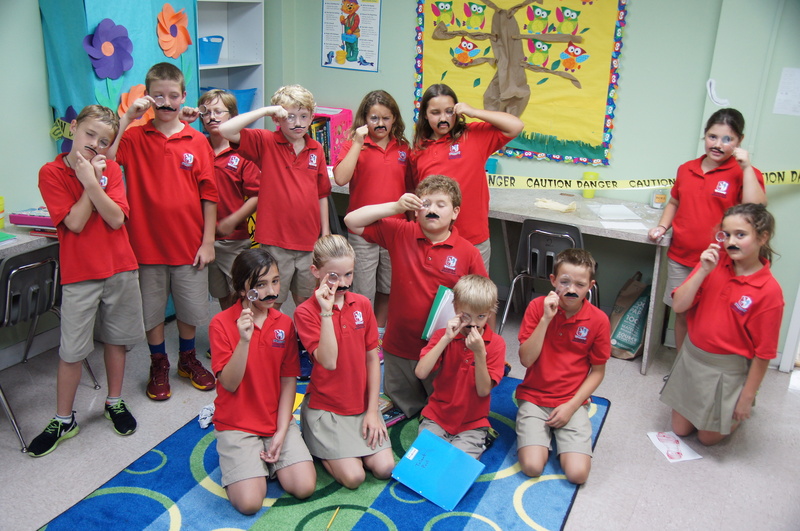 The students, who had been reading mystery books, were quick to notice the clues left behind at the scene. They found footprints, hair samples, fingerprints, an I.O.U, and a secret message. Over the past weeks, the students have studied handwriting analysis, fingerprint patterns, a variety of secret message decoding, and logic problems to brush up on critical thinking and deductive reasoning. They have also written their own mysteries and learned the language a gumshoe detective would use. They learned to explain an alibi, a red herring, and determine the difference between a suspect and a witness. Footprints are measured, analyzed, and placed into the evidence file. The mystery continues as the students compile all of the evidence. After all information is gathered, the students plan to summon and interview suspects for the crime. There are several Grandview teachers on the not-so-short list! Why would someone go to such great lengths for a lesson on mysteries? It could be because mysteries provide rich environments for the productive and receptive skills of listening, speaking, reading, and writing. They provide challenge for the puzzle they create. In addition, they are just fun. There are many kinds of mysteries. Some can be solved and some cannot. This type of intrigue pulls in the reader and creates interest. This is the true goal of any reading teacher. While reading the mystery the students begin to draw inferences about history, attitudes, and beliefs. They absorb all these details and they don’t even realize that they are learning. The skills of precision and accuracy are also important components that students learn while reading, writing, and solving mysteries. 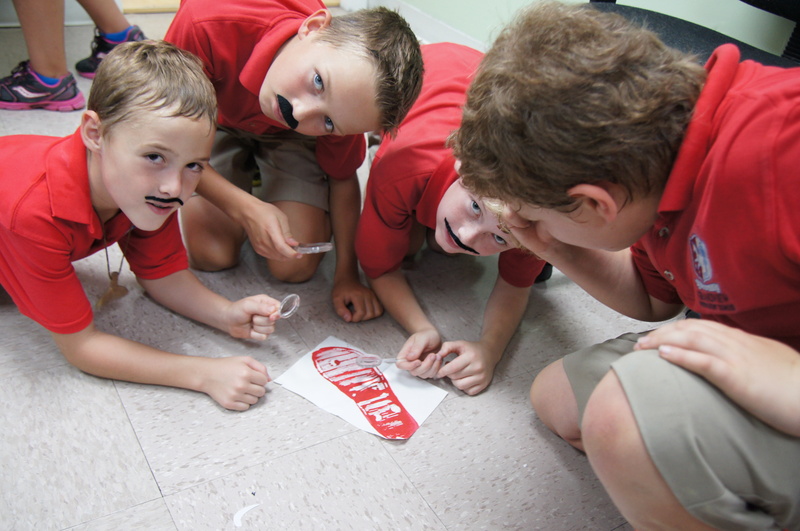 The list of valuable lessons learned from immersing students in a good mystery is extensive. So, the future detectives in Mrs. Kubach’s Talent Pool class not only will find those pickles and the culprit behind the mystery, but they will also pick up some valuable problem solving skills along the way! Mrs. Kubach’s class at the crime scene. Tags: Critical thinking, Deductive reasoning, Education, Mystery fiction. Bookmark the permalink. This was a great lesson and the students continue to talk about it.